Flocculants are chemicals used in water treatment processes to improve the sedimentation or filter-ability of small particles. Flocculants are used to remove microscopic particles which would otherwise cause water to be cloudy (turbid). Establishing chemistry control of the SFP’s at Fukushima has been very fragmented and has involved minimal attempts at filtration and chemistry addition such as boric acid. Very limited information is available from TEPCO on the total water purity chemistry. It is our assumption that the water chemistry is completely out of specifications mentioned above and has established conditions for optimal corrosion. The normal cleanup systems at the SFP’s at Fukushima have been replaced with at best temporary water system with filtration and reverse osmosis. Approximately 8-9 months after the accident TEPCO did attempt to get the chloride concentration down in specifications after having been in the 6900’s of ppm/ml as compared to a normal level as seen above. There is no information that can be gathered to verify if the racks at Fukushima SFP’s is of the original aluminum or the upgraded stainless steel. Knowing the type of rack material is central in determining estimates for corrosion. The only fuel that has been removed to date were 2 unused fuel elements that were removed from unit 4 SFP but since they were relatively new had no major signs of extensive corrosion but there was a lot of debris within the fuel element. There are some seldom mentioned phenomena that occurs in operating reactor fuel elements which depend on a term called “FUEL BURNUP”. All nuclear power plants (NPP’s) must determine to what degree they allow the reactor fuel element to burn up ie: what percentage of the actual fuel (like U235) is acceptable to burn up before the fuel element reaches its end of life. Since NPPs are in the business to make profits, many utilities have increased the burn up limits to decrease operating costs. assembly and rod vibration. Debris fretting continues to be a common mechanism for fuel failure in all types of power reactors. • Plug defects, and several types of end plug weld deficiencies. These are a few of the major issues that can arise with NPP fuel elements and each can lead to what is called a “LEAKER FUEL ELEMENT” ie: a fuel element that has had some minute cracking or failure of the cladding around the fuel pellet which results in fission products to be dispersed in the primary coolant system. When the leaker fuel element is then placed in a spent fuel pool that same leak may seal up or it may open and release fission products directly into the spent fuel pool. The link above has a detailed section on fuel element leakage in operating reactors as well as spent fuel pool. The main result of a leaker element is the rise in gross activity levels, interaction with the leaker site and the water in the reactor or spent fuel pool. These leaked fission products can result in levels of activity which would not allow work to be done in the area and in the case of Fukushima, would be directly released into the atmosphere. Increased levels of Xe133 is the main isotope that is watched for spotting a leaker. Iodines are also monitored for changes especially when the reactor is shutdown. The most common ratios utilized as indicators of fuel failure are: 133Xe to 135Xe, 133Xe to 138Xe or 85mKr to 87Kr. A significant change in the value of such ratios is a clear indication of fuel failure. In addition, the presence of transuranic isotopes (actinides) in the primary coolant is an indication of the presence of fissile materials in the primary coolant due to erosion of fuel pellets through large defects. of fuel rod failure is based on the detection of fission product activity released through defects during sipping. The more common radioisotopes measured are xenon and krypton, and cesium or iodine in water samples. Various versions of sipping have been used to detect leaking fuel assemblies. To date TEPCO has not mentioned the use of sipping in any of the SFPs. No reported efforts have been reported by TEPCO on any efforts to directly determine if fuel element failures, including fuel leakers, have occurred in the pools. Failure to implement “sipping” or equivalent techniques”undermines the ability to be proactive and look for changes in the pools which would lead to fission product leakage/release. In addition, TEPCO has not released any information on the number of known defective fuel elements which may be stored in the SFPs including ones that are in canned storage. Every analysis that has been researched concerning fuel degradation in spent fuel pools has included a qualifying statement, “assuming the chemistry of the spent fuel water is maintained” Clearly the SFPs at Fukushima have undergone unprecedented severe accidents, extreme thermal cycling, unknown chemistry, fires, damage from debris falling into the SFPs including a huge roof truss section which fell directly into the #3 SFP while removing debris. The key and most important parameters went to extreme levels out of specification and were unchecked for months. From these conditions as well as missed attempts to try and bring the water into some form of gross control, the assumptions for degradation rates will be made using the worst case conditions. These are important questions that involve very complicated analysis to predict in a way that can relate to time, such that projections for failures can be made. The idea is to eventually remove the fuel from the spent fuel pools. However, the planning how to achieve this goal is in it’s infancy, since there has been no case like Fukushima from which to look back and see what was done. 5. Steam Eruption from Nuclear Power Plant Cooling System. 6. 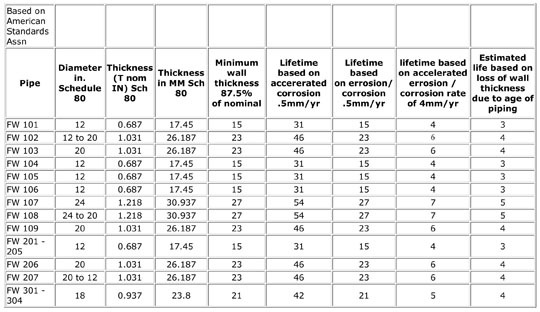 Durability of spent nuclear fuels and facility components in wet storage.